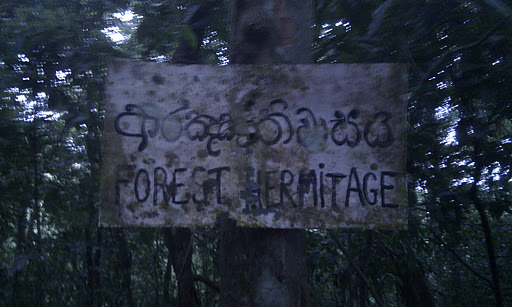 I feel privileged to visit the Forest Hermitage. This is an historical place for Western Buddhists and where Ven. Nyanaponika and Ven. Bhikkhu Bodhi both lived and worked for many years. Ven. Nyanatusita is very kind and patient with me. He showed me around and answered all my Dhamma questions and questions about daily life. Bhante is a very intelligent and practical man who works very hard for the Buddhist Publication Society. I encourage all readers to visit the BPS website and download the collections that are free or at low cost. There are two cats also living at the FH and I have a mild allergic reaction to them manifested by sneezing and itchy skin. Bhante allowed me to read an early proof copy of the forthcoming complete translation of the Anguttara Nikaya by Ven. Bhikkhu Bodhi. I didn’t read it cover to cover and there were bits missing even as it was. I was able to read many sutta that had puzzled me while reading Woodward 100 plus year old English translation published by the Pali Text Society. Excellent work Ven. Bhikkhu Bodhi! I met a young German and a young Austrian monk staying in the monastic compound next to the FH. There is also a kind Sri Lankan lay man working as caretaker at FH. Ven. 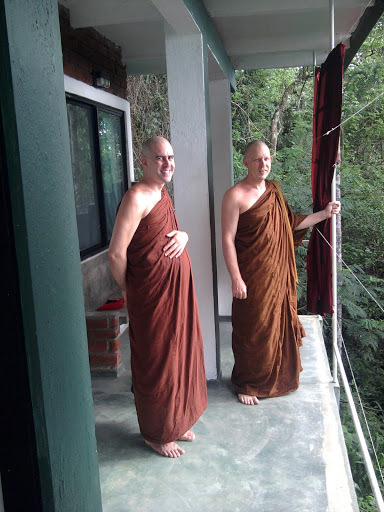 Nyanatusita, the Austrian monk and I rode in a three-wheeler driven by Nihal (excellent driver and enthusiastic monastery sponsor) from FH to one of 3 (or more) monasteries at Hantana (a hilly district adjoining Kandy) to visit Ven.Subhuti, a US monk. This monastery is about 800m above sea level and located on the site of an old tea estate. 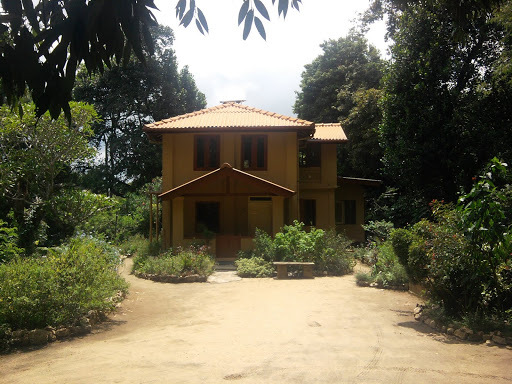 It feels remote, despite being only 20 minutes from downtown Kandy. 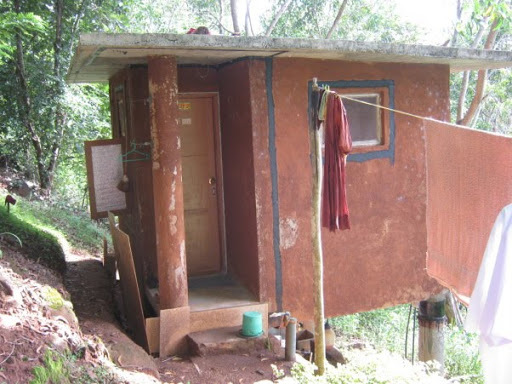 There are many poor Tamil tea workers/families living on the slopes around the monastery. Ven. 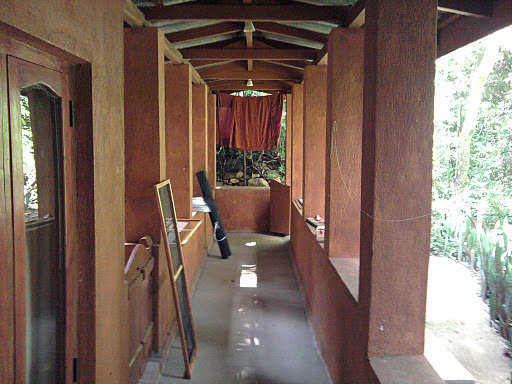 Subhuti usually stays at Na Uyana Aranya. 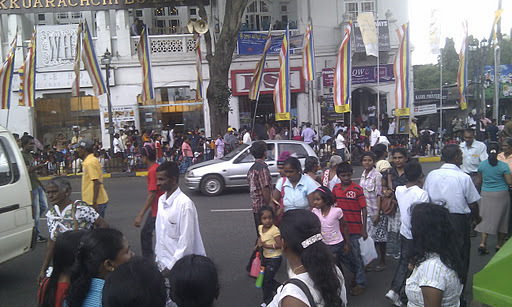 Nihal had to return to Kandy by 4:30pm. I plan to visit Ven. Subhuti again this afternoon. My lower back has been painful for the past few days. I think it is due to the travel. I won’t let it stop me though. As with all physical pain, if we focus our attention on the painful spot(s), we can notice how it constantly changes. What changes is suffering, whatever is suffering is not me, not I, not mine. We let go of whatever is not ours. Then there is release, freedom and liberation. 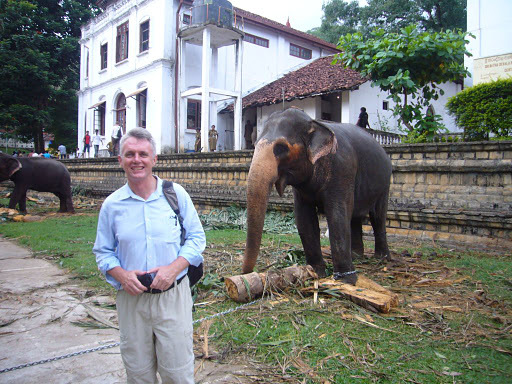 Monday, 3 May 2010: I left Na Uyana Aranya and came to Kandy which is cooler and is the home of the Buddhist Publication Society – a wonderful bookshop with attached Buddhist library. I plan to go to Negombo on Tuesday, 12 May and then depart Sri Lanka on Friday, 14 May, stopping over in KL for about 12 hours before continuing on and arriving in Perth on Saturday, 15 May. While in KL I will try to visit the W.A.V.E shop and maybe obtain even more Dhamma books. Saturday, 8 May 2010: I have visited the Buddhist Publication Society shop many times during this week and purchased many books that the BPS has posted by surface mail to Perth. 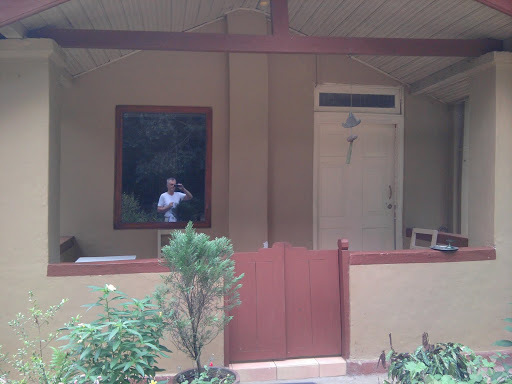 I also spent a lot of time in one of the Kandy Internet cafes, writing e-mails, doing research and catching up on news. On Wednesday, I went back to Na Uyana to donate some items and pick up a letter that arrived after I left. I only stayed one hour. 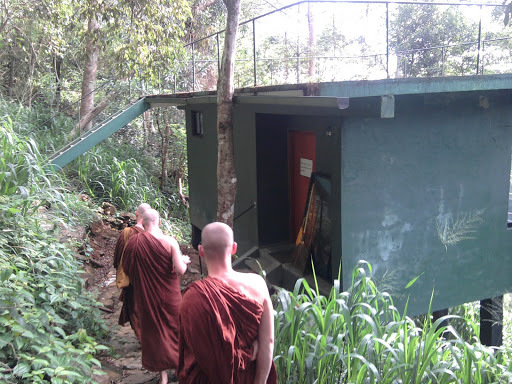 This morning I visited Venerable Nyanatusita at the Forest Hermitage on the outskirts of Kandy. He is the current editor of the BPS and has a Dutch background. He told me that he was ordained in Sri Lanka in the Galduva tradition and has spent a few years living at Bodhinyana Monastery with Ajahn Brahmavamso. I asked many Dhamma questions and Bhante very patiently answered with humour and wisdom. I was delighted to learn that Bhante is currently translating the Vimuttimagga from Chinese into English. This is excellent news. The first English translation of the Vimuttimagga by Soma Thera and Kheminda Thera et.al. was done quickly and not originally intended for publication. Nevertheless, the first English translation has been translated from English into other languages including Thai. Surely it would be better for those Thai translators and other language translators to have translated from the Chinese text rather than compound the errors in the first English translation. For the sake of Buddhists who use languages other than English and Chinese, I do hope that in future translators into Thai and Burmese etc. will base their efforts on the Chinese text. Many people seem to prefer the Vimuttimagga over the Visuddhimagga because of the latter’s abhidhamma influences and divergance from the suttas. I’m sure that a new English translation of the Vimuttimagga will recieve a lot of attention by meditators and scholars alike. Ven. Nyanatusita also told me that the next edition of the Visuddhimagga is not far off and that the publication of the next edition will coincide with its release on the Internet, possibly as a PDF. I gave away my previous copy of the Visuddhimagga when I was in Myanmar last year and was keen to get another copy. I finally obtained a new hard bound edition for 1000 Sri Lankan Rupees (about $10). It must weigh more than 1kg on its own. There was only one more copy at the BPS. These two were recently found in storage. It is almost impossible to find new copies for sale now so the new edition will be warmly welcomed. Having it on the Internet will also make it convenient for casual readers or those who can tolerate reading books on computer screens. There is an interesting article about the Visuddhimagga and Vimuttimagga by Venerable Analayo which I recommend you read. We live in good times for Buddhist studies and practice. The standard of scholarship seems to have improved vastly during the past century. I hope to see more advances in this life time. At this time of year Na Uyana Aranya is hot and humid. My own kuti was not shaded from the afternoon sun and the concrete walls and ceiling absorbed the heat during the day only to slowly release during the evening. My walking path was also exposed to direct sunlight during the day. Many ant trails crossed the path at random places. 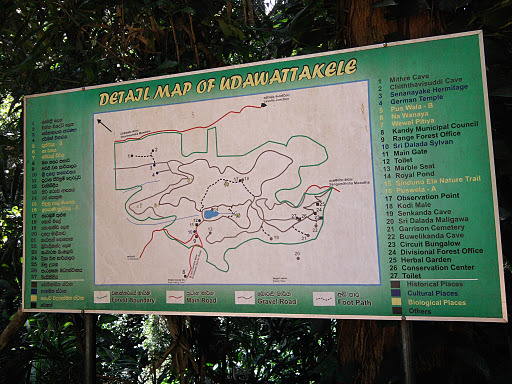 The kuti was located about 15 minutes walk up a steep rugged path that is muddy and slippery after rain. The steps are high and awkward. Walking around in thongs is also inherently dangerous, all the more so when the feet are wet and the ground muddy. 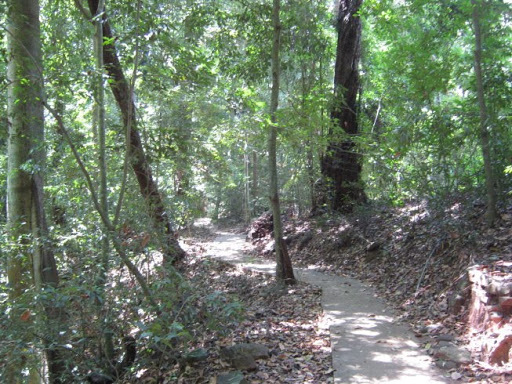 There are many concrete paths at Na Uyana Aranya but not on the way to the kuti I was in. 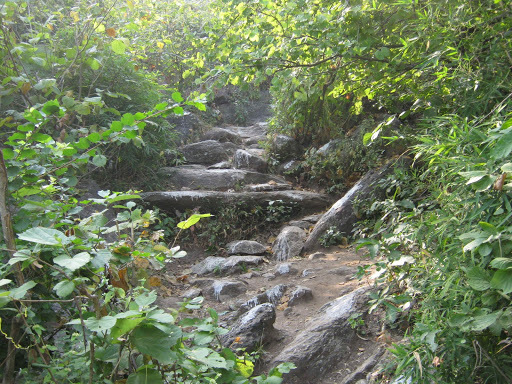 One needs to climb the paths at least once a day to eat at least one meal a day. There is breakfast and lunch available. Some people also attend morning chanting, evening chanting and group meditation sessions and inevitably climb up and down many times in a day. My 50 year old knees complained a lot, especially if I was loaded with a 25kg backpack which was not very often. It usually took one or two weeks for the knee pain to subside after carrying the pack up or down. My kuti also had many very small mosquito-like biting insects “hopitos” [not sure of the spelling or even if I’ve remembered the name correctly]. Despite their small size, they seem to be vastly more persistent in finding ways to repeatedly bite one than any mosquito I’ve encountered. My feet, elbows and to a lesser extent head were covered in their bites which are very itchy. 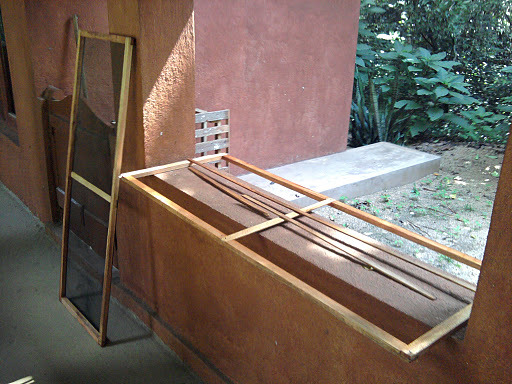 I used incense to discourage them to some extent and always slept under a mosquito net in my kuti. These relentless insects are active from about 4pm to 9am every day. I learned from Sri Lankan monks to paint the columns of my kuti with smelly black sump oil which inevitably soiled my white upasaaka clothes. To some extent this prevented the trails of ants climbing the columns and entering the kuti. Even so, the ants still found ways to enter. Maybe they drop from trees over the roof? Fortunately, the ants did not bite the body. My concern was not to inadvertently kill them while moving about or while bathing. The monastics eat food in a daana saala (food hall) above ground while upaasaka would eat on the ground floor sitting on benches. This area is not so clean and there are many flies. 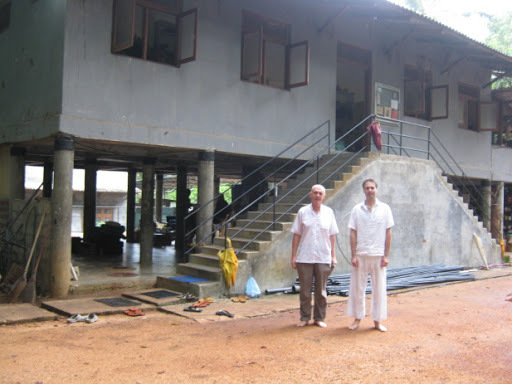 ABOVE: Michael and Stuart in front of the food hall, Na Uyana Aranya May 2010. Monastics eat upstairs and lay men eat at ground level. Previously, I have meditated in cooler more convenient conditions. No situation is perfect. There will always be some condition or another that we may struggle with. Even in the conditions I experienced at Na Uyana Aranya, there are other monastics and upaasaka (lay men on 8 precepts) who appeared to survive and thrive. Many of my previous teachers, even as long ago as 1983, have told me that I indulge in restlessness. I found that aanaapaanasati is excellent practice and will continue to practice this way for the time being. I experience a relative calmness and sensed that I was making progress though slowly. Besides the difficult physical conditions mentioned above, I also hampered progress by talking with others for short periods almost every day and reading Dhamma books borrowed from the Na Uyana library. Usually conversations were of a practical nature concerned with getting things done or they were related to the Dhamma. Ideally, there should be no conversation except with the teacher at meditation interviews. I probably made conditions worse for myself by voluntarily gardening along various sections of the paths around the monastery. 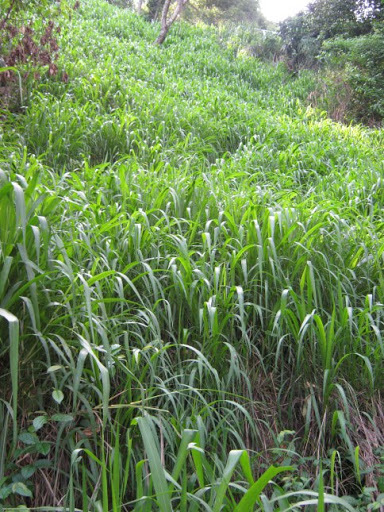 There is a type of long grass (which may have originated in Africa and been introduced by the British colonizers) and a few other plants that tend to take over paths rather quickly. I borrowed a short machete from another yogi and slashed away at the grass or pulled out clumps of grass after rain had softened the soil holding its roots. Bhikkhus are constrained by a vinaaya rule prohibiting them from damaging plant life and if they ever saw me working, they would smile or thank me for my efforts. Of course there are regular work gangs organised to eventually clear the paths but I felt it was an opportunity to make merit. ABOVE: Long grass near eastern side of the lake in Kandy, Sri Lanka May 2010. This same grass infested Na Uyana Aranya. 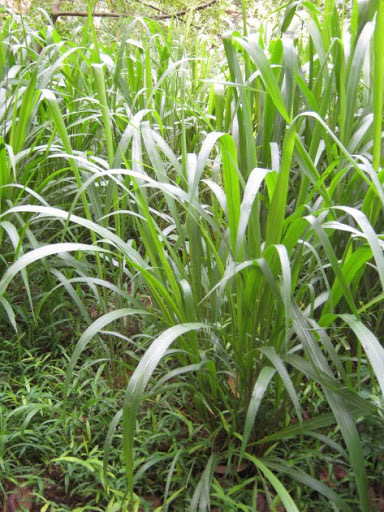 It grows 2-3 metres tall, has sharp blades, prickles on the stalks and its sap seems to burn exposed skin. While gardening, I would cheerfully recall the effort of Sumedha making a path with his own body for the Blessed One Diipankaara and the Sangha before taking his bodhisatta vow, 4 innumerables and 100,000 aeons ago. I would recall the development of the Noble Eightfold Path, even though gardening service is not one of the Path factors. I would recall the Visuddhimagga notes on preparing for meditation, cleaning one’s kuti, one’s body and surroundings in order to improve concentration. I therefore imagined that by clearing the paths, I would be helping the monastics and upaasakas to develop deep and stable concentration. 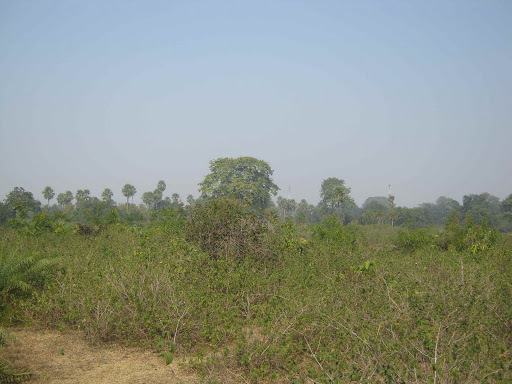 I would recall that Na Uyana Aranya has many snakes, scorpions, centipedes and other creatures that dwell in grass. By clearing the long grass and weeds away from the path, these creatures and the people using the paths were likely to notice one another before direct contact and possible harm. Perhaps in some way this work prevented loss of life, pain and injury. Hmmm… that is a lot of thinking, even if it is wholesome-kusala. I relate these thoughts in this blog to encourage readers to consider their own daily work in a wholesome way. It is possible to derive merit from many kinds of work even work that is not so directly involved in serving the Sangha and other virtuous people. I shall try to give more such examples in later blogs. 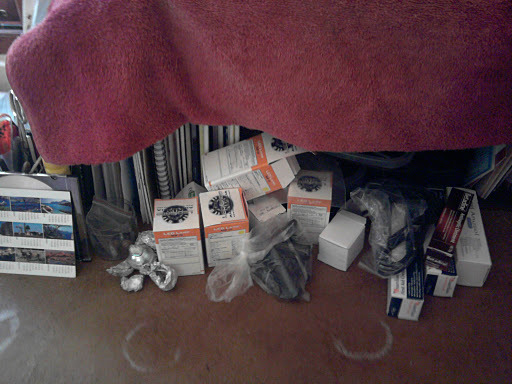 Even so, this physical work was not so good for my lower back, knees, shoulders or hands. I was lucky to have gloves which protected the skin of my hands but the sinews and muscles were a bit strained by the effort of grasping and pulling the clumps of grass. They are still sore now. Sacrificing the comfort of the body is necessary for accumulating merit and developing those skillful qualities – kusala that will eventually lead to Nibbaana. There are too few opportunities for making merit. How often do we have direct encounters with the Sangha, with virtuous people striving for penetration and higher mental states? The Sangha is the unsurpassed field of merit. So what is a bit of pain in the back or the hands? 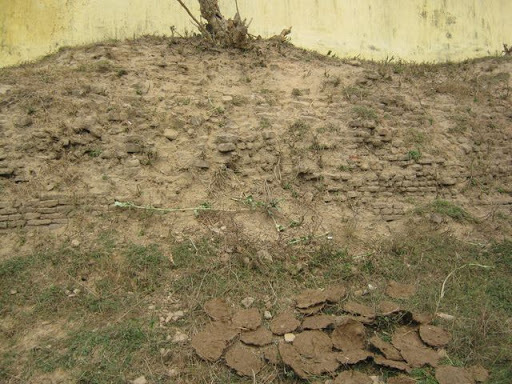 Tuesday, 22 December 2009, I hired Mr Jagbinder Singh and his car to go to the Gurpa mountains where Mahaakassapa is reported to have attained Parinibbana. According to Mahayana tradition, Mahaakassapa did not die but remains alive in a deep meditation state inside the mountain, waiting for the enlightenment of the next Sammaasambuddha – Metteyya (known as Maitreya in Hindu and Mahayana traditions). According to this story, Mahaakassapa will pass a robe once belonging to Gotama Buddha to Metteyya Buddha. For my part, I am Theravada Buddhist and don’t know much about the Mahayana tradition of Bodhisatta (Bodhisattva in Sanskrit). 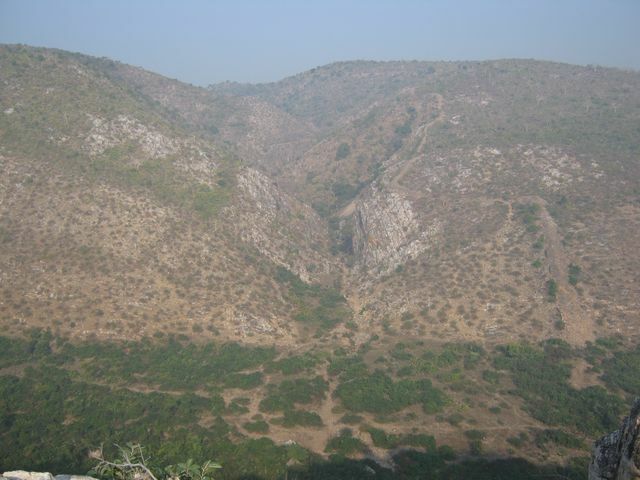 I believe that Mahaakassapa and other ancient arahats spent a lot of time meditating in these hills and probably died there. There is no citation in the Paali Canon to say where Mahaakassapa passed parinibbana. After Lord Buddha Gotama’s parinibbana, Mahaakassapa was accepted by most of the Sangha (community of monks) as the leader, though he did not covet such status since he had long attained full enlightenment as an Arahat. Interested readers may like to read short biographies of Mahaakassapa at Palikanon.com, Access to Insight (by Helmuth Hecker) and the book Great Disciples of the Buddha by Nyanaponika Thera. Mr Jagbinder drove us north from Bodhgaya, through Gaya until we turned right (eastwards) at a turn-off (hard to describe the location) about 5-10 km north of Gaya. The road was very rough, and narrow for about 20 km so we had to travel slowly paying attention to avoid countless pot holes and many other people and animals on the road. It turns out we would have been better off going further north before turning east and taking a slightly longer route (may be an additional 5-10 km) on a better mostly sealed road. We took this route on the return journey. We eventually reached Fatehpur, a small village and then drove further on rough, dusty roads to Gurpa village. On reaching the village we had to wait 10 minutes at a railway crossing. It seems possible to take a train from Gaya to Gurpa village, though it may be 3rd class. It may not be too bad since it would be a relatively short journey – maybe less than one hour travel by train. 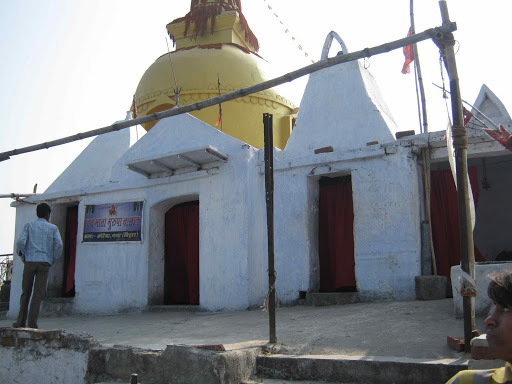 It took us about 2 hours by car to reach Gurpa village from Bodhgaya. We may have travelled faster if we were in Tata Sumo or other 4-wheel drive vehicle or on motorcycles. Mr Jagbinder told me that many passenger and freight trains pass here going between Kolkata and Delhi and various destinations in between. After crossing the rail lines, we proceed a short distance through the village until the road ended near a large tree and a stream. The tall dark profile of Kukkutagiri was southwards beyond the tree. The tallest hills in this area including Kukkutagiri are about 300m high. 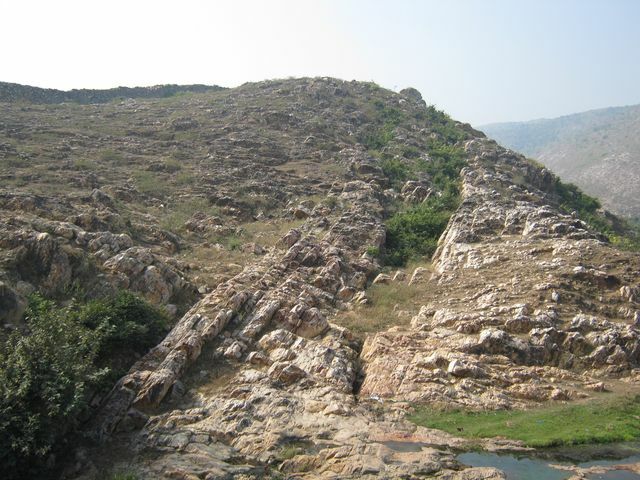 ABOVE: View of the profile of Kukkutagiri looking southwards from the edge of Gurpa village, Bihar, India. 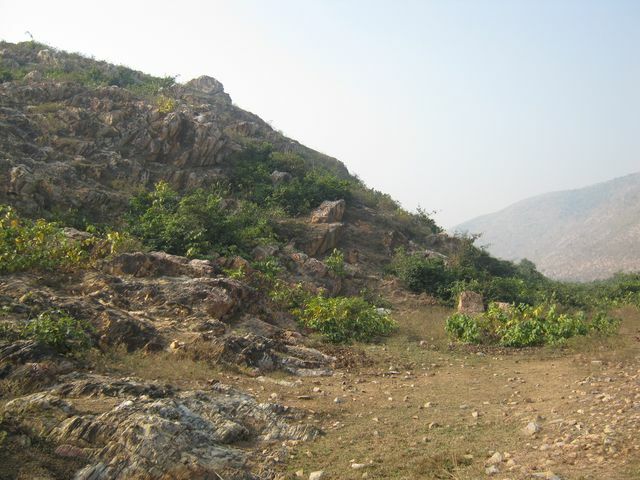 The peak on the left (east side) shows the Metteyya stupa at the summit. Mr Jagbinder negotiated with 3 boys to guide me up the hill for 100 rupees. It did not seem necessary to me as I was confident of finding my own way up the hill. However, Mr Jagbinder said it would be good to have companions on the walk since this was still a somewhat dangerous area. 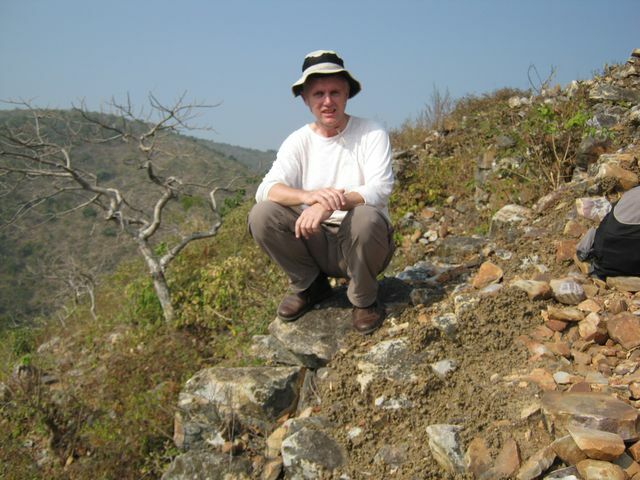 It was previously prone to bandits/Naxalite activities and Mr Jagbinder thought it would be prudent to have companions who could talk with anyone we met on the way up the hill. He briefed the boys as to who I was and what I was doing (a Buddhist pilgrim from Australia going to pay respect to the shrines of Mahakassapa and Metteyya Buddha). We walked through rough scrub and passed goats, cattle and local people who seemed to be gathering sticks from the scrub. The men all carried or were using long sticks with small axe heads to chop the short trees among the scrub. After about 1 km walking along narrow paths, we reached the foot of the hill and the concrete steps leading up the hill. A local man who spoke a little English and armed with one of those stick/axe tool/weapon greet us and insisted on being “security” for the walk up the hill. I didn’t argue with him or negotiate a price. 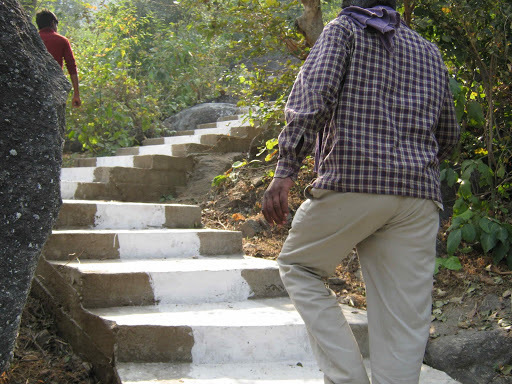 He spoke aggressively with the boys in Hindi and then we commenced the climb. It was very steep and hard work. I wore a white t-shirt and nylon trousers and my walking shoes. I also wore a hat and carried one litre of water in my day-pack. We stopped several times on the climb to rest and I took photos. The scenery was beautiful though haze would not allow me to see the horizon. The man walked in front of me and smelled of tobacco etc. The boys were sometimes in front and sometimes behind – always talking loudly with each other and with the man. It would have been better were I alone to contemplate the significance of this sacred place, even so, I was grateful to be there and was happy nonetheless. The concrete steps seemed to be newly constructed. Someone had painted a white stripe in the centre of the steps leading the way upwards or downwards. 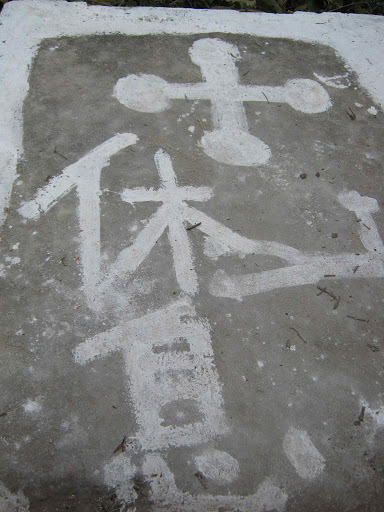 I saw crudely painted figures of human and cross shapes here and there – not knowing the significance of them. 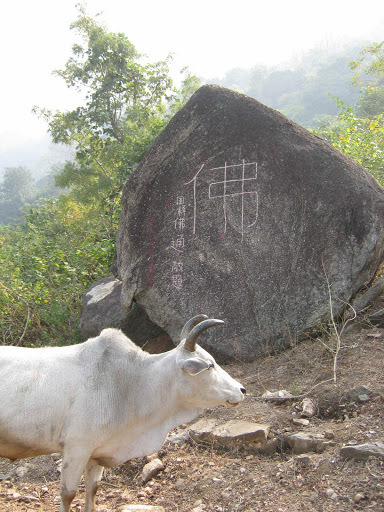 There was also some Chinese characters carved on a rock about one third of the way up. I recognised the largest character as Fó (佛)- the character for Buddha. We reached a point where we turned left (eastwards) and walked a short distance up some more concrete steps to the entry of a very narrow passage through the rocks (northwards). We rested a little and then continued the climb. I had to turn my body slightly side ways to walk without scraping the sides too much. It became darker and then we had to turn left (westwards) in almost pitch dark. I turned on my phone flash light but this was relatively dim. The path then turned right (northwards) and I had to stoop to avoid bumping my head. My day pack scraped the rocks above as I walked though to day light again. Now we were on a large ledge facing northwards and westwards. 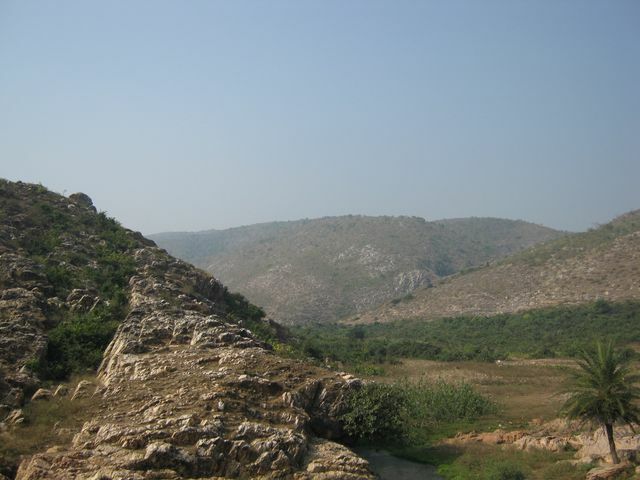 I enjoyed the view and took some photos of Gurpa village and the nearby lower and west side peak covered in large boulders and small trees/scrub. 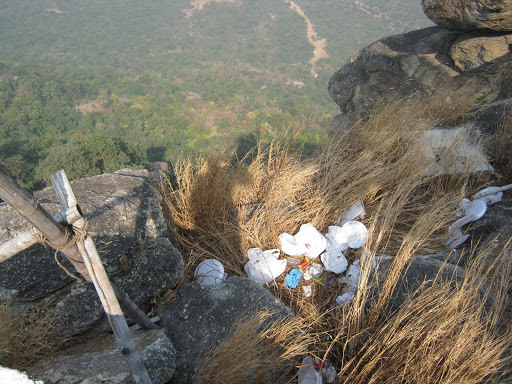 I looked down the slope and could see a lot of rubbish strewn about on a ledge about 3m below. I could read “Lotus Nikko Hotel” on some of the packages.Perhaps a tour group had brought a packed lunch from their hotel. I would hope that the hotel staff or tour guides who brought the group up the hill would collect the rubbish and return it to the hotel. 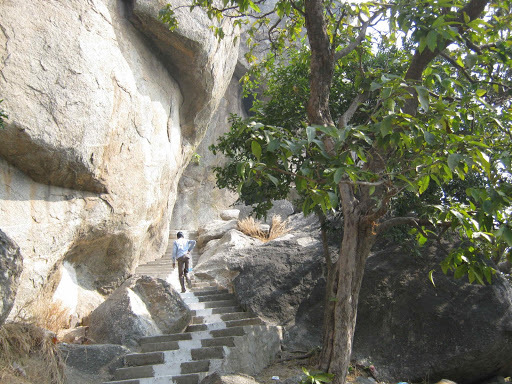 Prompted by my four guides, I turned southwards and stoop-walked between some large boulders down to a gold and white painted construction about 3m square and maybe 6m tall. 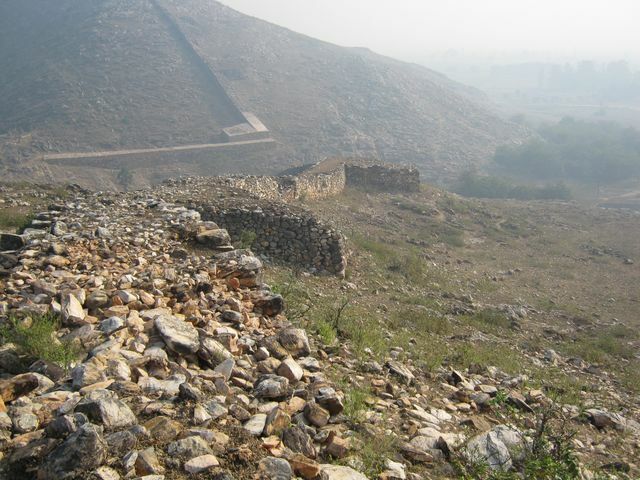 There was another veranda facing south-east with a newly constructed tank (see photo of adjacent summit below for a view) which was empty of water but contained a few leaves and other rubbish. While paying respect to the Mahaakassapa shrine, 2 more local boys arrived and claimed to be caretakers of the site. Now I had 6 guides. After taking photos I was led back northwards between the boulders and then we turned right (eastwards) and up a few more steps to a temple and stupa on the peak of the mountain. It would have been good to have seen this site in its natural state before any human construction. I imagine that Mahaakassapa and other monks would have sometimes sat on the boulders at the peak. The crudely built temple comprised three small rooms with curtains covering the doorways. 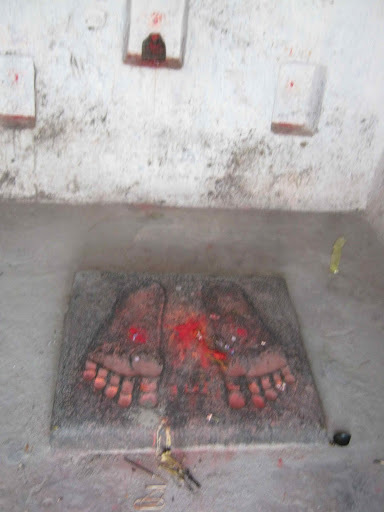 I was invited to look in the left-most room and saw some carved foot prints which were apparently supposed to be of Lord Buddha. I estimate the length of the foot prints were about 40-45cm. Someone had dropped red paint on them which I believe may be a Hindu practice. Ven. 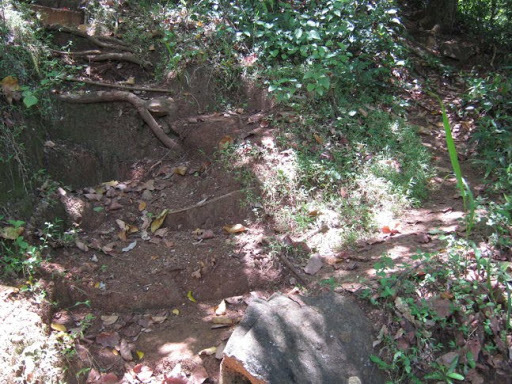 Dhammika in Middle Land, Middle Way, wrote that locals believe these prints to belong to a Goddess of the mountain. Even so, there was a small Buddha statue in the room. I didn’t inspect the other rooms. 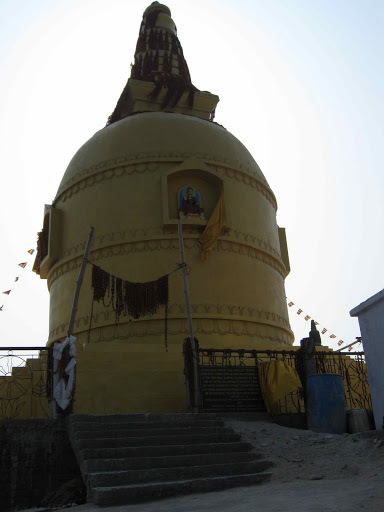 I then circumnambulated the Metteyya stupa and took some more photos. There is no reference to Metteyya in the Paali Canon, only in post-canonical literature and in non-Theravada traditions such as Mahayana. 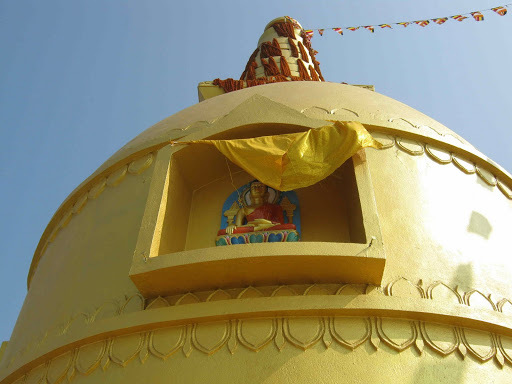 However, the Paali Canon does refer to seven previous Sammaasambuddha beings and many Paccekkhabuddha beings in the past, so I believe that many more of both types of Buddha will arise in the future when the current Buddha’s dispensation has disappeared from recorded history and knowledge. Whether the next Sammaasambuddha will be named Metteyya or not, I don’t know. It isn’t that important to me because Gotama Buddha – our historical Buddha gave us more than enough teachings to make progress in the Dhamma and to attain Nibbana. We are fortunate enough to be born in the dispensation of Gotama Buddha so we may hear, study and practice the Dhamma at this time. We don’t need to imagine some possible future time of Metteyya Buddha for our possible salvation, it can happen right now. Be in the present moment. You may learn more about the 17th Gyalwa Karmapa Urgen Trinley Dorje on his website. There is also a short text article and an online video of the stupa consecration mentioned above. 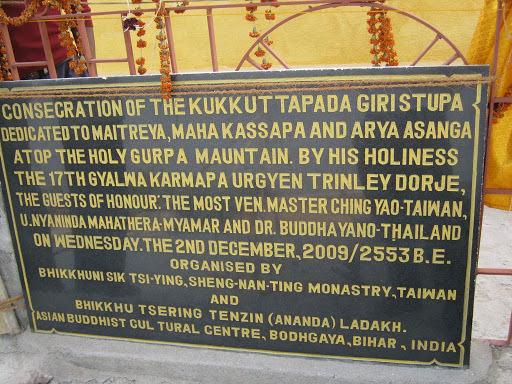 I personally don’t follow him and never heard of him until I read that sign on Gurpa Mountain. Here is another interesting article about the consecration including some photos of the the steps, Mahakassapa chedi, the Metteyya Stupa and the pilgrims attending on the day etc. Mr Jagbinder later told me that on the day of the consecration, around 80 Tata Sumo vehicles drove from Bodhgaya to the site. The two brothers who came later while I was paying respect to the Mahaakassapa shrine told me that since the consecration other pilgrims had visited the site in smaller groups mostly from Japan and Taiwan. ABOVE: The view looking westwards from the balcony next to the Metteyya stupa on the summit of Kukkutagiri. The adjacent summit seems to invite further exploration. 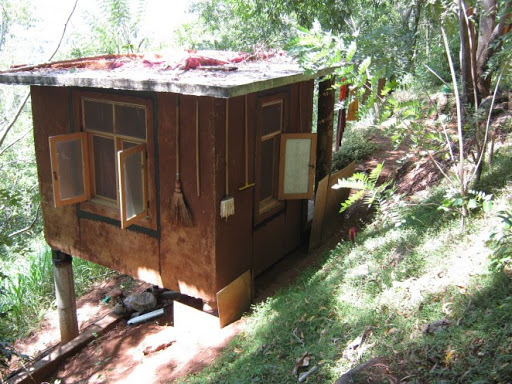 This photo also shows the small tank on the balcony of the Mahaakassapa shelter. It had taken one hour to reach the summit of Kukkutagiri. I spent about 20 minutes there and it took about 30 minutes to return to the car and Mr Jagbinder. He had stayed behind to guard his car. I paid the man 100 rupees, the two brothers 100 rupees to share and the 3 boys 100 rupees to share. Just as we were about to drive away, two more men came and claimed to be the official caretakers, demanding that we register our names in a book and pay a fee. I asked for official identification which was not forthcoming and also asked why they weren’t doing their jobs taking care of the site. Mr Jagbinder also spoke in Hindi and they calmed down. We drove off and were delayed again at the railway crossing for about 20 minutes as several trains passed about 5 minutes apart. We fixed a car tyre puncture while waiting. 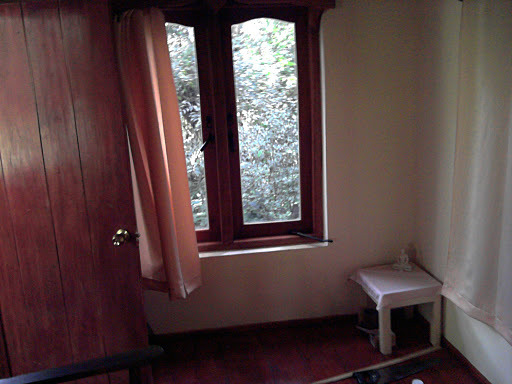 I got back to the Deep Guest house around 2:30 PM, took a shower and ate some lunch. I was quite hungry since I had not eaten breakfast or lunch, not even a cup of tea. Breakfast at the Deep starts at 8:00 AM and Mr Jagbinder had picked me up at 7:40 AM. I then rested in my room reading an English novel version of the Mahabharata by Meera Uberoi. 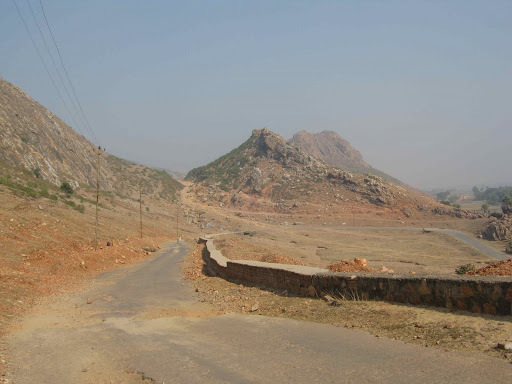 It was tough work climbing the Kukkutagiri, Ratana Hill (Gijjhakuta), Isigilli (Sona Hill) and Giryek Mountain (Indasala cave), Vaibhara Hill (Satapana Cave), Brahmayoni (Gayasisa) and so on… There are many hundreds of kilometres between the various places that Lord Buddha and the Sangha of old walked to and from. Having personally climbed these hills I can testify that without modern paths or their equivalent it would be very difficult to access these remote locations. In the ancient times the dense forests had not been cleared and there were many wild animals roaming around. 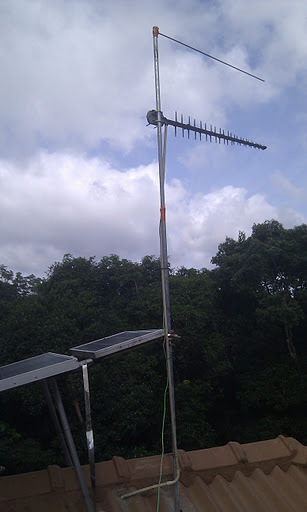 Now the forests have been mostly cleared and the animals we see are domesticated goats and cows. While walking around these places I frequently wondered in amazement at the strength and fitness of the ancient Sangha. They would have to climb up and down on a daily basis to get their alms food for the day. Just reading the suttas in books or listening to audio does not convey the meaning that one experiences at these locations. It is amazing, really amazing. Then I considered that Lord Buddha and others in the ancient Sangha were still walking around and climbing tall hills in jungles and forests while aged in their 70s and above. 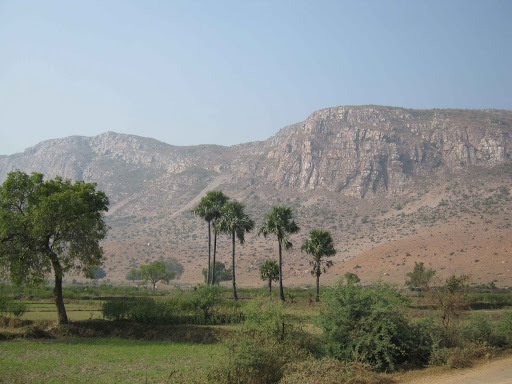 In some accounts Mahaakassapa and other arahats were 120 years old or more and still living under trees and in caves located in remote places such as Kukkutagiri rather than in relatively comfortable monastery buildings located close to faithful lay people who would provide abundant alms. 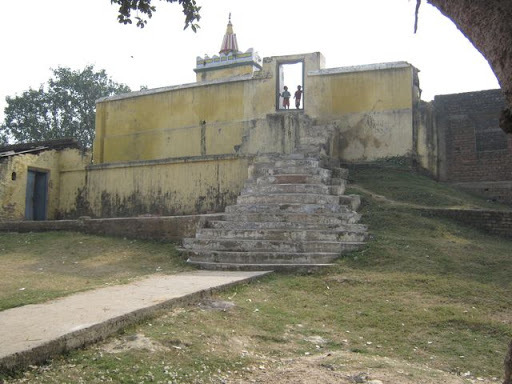 On Sunday, I phoned Mr Jagbinder Singh from Gaya who had earlier driven me to Rajgir and back to Bodhgaya to see how much he would charge for driving from Gaya to Rajgir pick me up take me to Nalanda and Jethian and then to Bodhgaya (the other side of Gaya coming from Rajgir). He said he could do it for 1200 rupees. This compared favourably with the Hotel Siddharth quote of 2500 rupees. 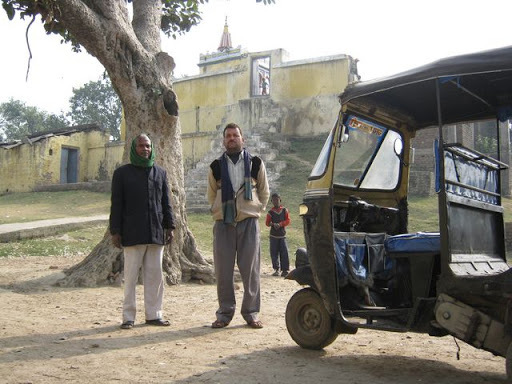 On Monday, 21 December 2009, I checked out of Hotel Siddarth and Mr Jagbinder drove me to Nalanda. It was an optional visit for me. 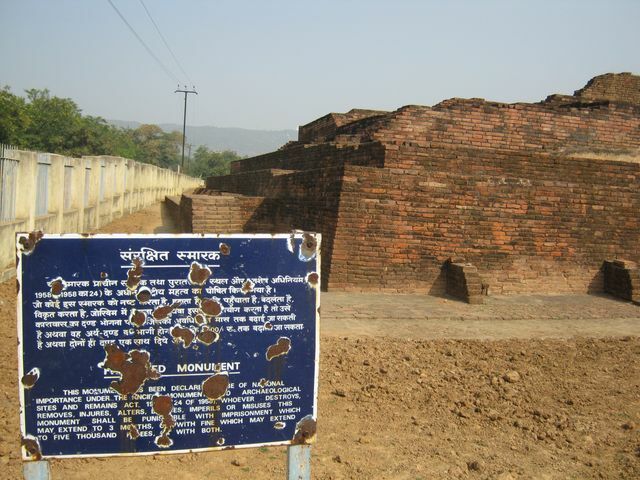 The Nalanda University ruins were another pile of red bricks for another 100 rupees to the Government of India. The lawns around the ruins were well kept though I didn’t come to India to see neat lawns. 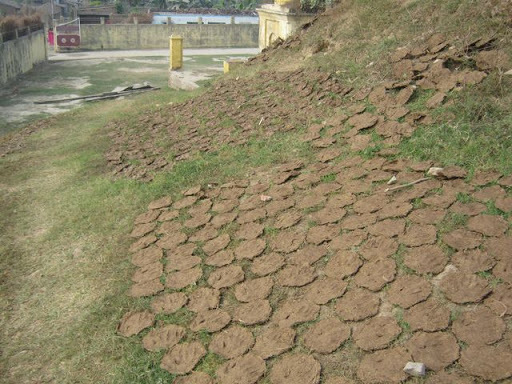 There was no visible sign of Buddhist worship at the site of the ancient Buddhist university since most Buddha images have been destroyed or removed. There were a few Bhutanese pilgrims at the site, but most were Indian tourists. Just outside the front gate, there are maybe 20-30 stalls selling snacks, souvenirs, drinks and so on. They seemed to be catering for the Indian tourist market. Two of the touts were very insistent that I buy a tour guide from them for only 40 rupees etc. I tried ignoring them and then tried to tell them I didn’t want anything but they still insisted on badgering me. I only escaped when went to the ticket office to buy the ticket for the ruins and the museum. I went across the road from the Nalanda university ruins to the Nalanda archaeological museum and walked around looking at broken statues and pottery for 15 minutes. Mahaathera Saariputta and Mahaathera Mahaamoggallana were both born and grew up in the Nalanda region. Their villages were close to each other. Mahaathera Sariputta also died (parinibbana) in his home village. 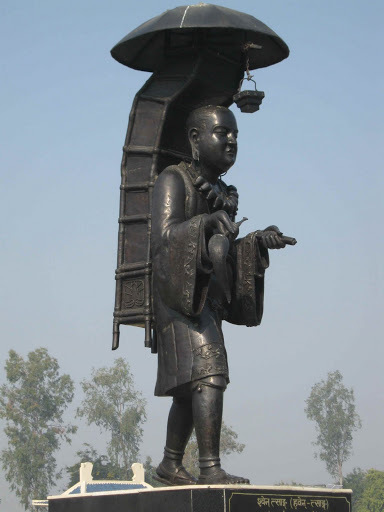 Lord Buddha also gave several discourses at Nalanda and on the road between Nalanda and Rajgir. I recollected these facts as we drove to the nearby Xuan Zang (Huien Tsiang) Memorial Museum. 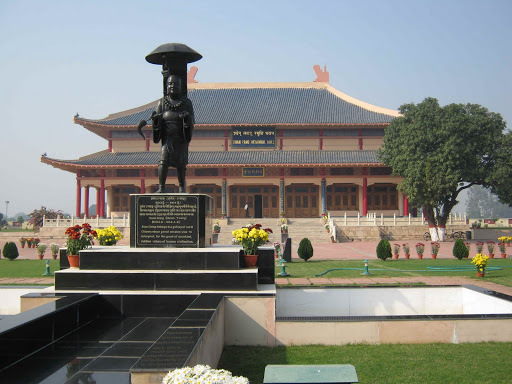 It is a large hall, with many large paintings on the walls and also the story of Xuan Zang’s (604 CE-664 CE) 17 year pilgrimage from China to India. The museum was quite different to other museums I have so far visited in India. 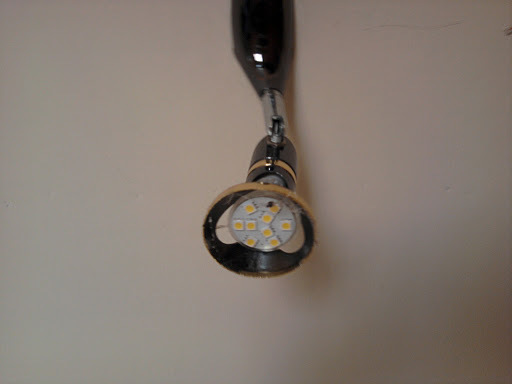 It seemed to have a much greater attention to detail and mostly likely a great deal more money invested in it. There was new construction on the adjacent plots of land. I was told by the ticket seller (50 rupees entry fee for foreigners, 5 rupees for Indians), that these would be quarters for scholars and an auditorium. I am not sure what they will be teaching. Maybe this is connected in some way with the new Nalanda University? Then we went to the Nalanda Multimedia Museum. There are no signs out front indicating the cost. I was charged 100 rupees and given a ticket saying 20 rupees. I asked for the other 80 rupees change but the ticket seller said it was foreigner’s price. He took my ticket back and gave me a new ticket that had no price on it at all… I complained a bit more and then shrugged my shoulders. I was then escorted to a small room with poorly drawn images of monks doing various activities at Nalanda Museum and told to wait while the computer slide show proceeded. It was not very interesting to me. The content could have been better presented with boards on the walls or by giving the visitor some control over the pace of the slides. Some were too slow and others changed before I could finish reading them. When this was over, I was taken to another room with a different slide show about the Nalanda University ruins which was similarly boring. Then I was told to wait a while and I would be shown a 45 minute film about the Nalanda ruins. I did not accept the invitation to see the film and told the officials that they should have a sign out front with the real prices. One of the officials then told me that the real price was 50 rupees for foreigners and 20 rupees for Indians. It seems that the ticket seller was cheating me by 50 rupees. I didn’t want to argue with anyone at all. I just want these things to be run professionally. I left without trying to get 50 rupees (about Aust $1.20). 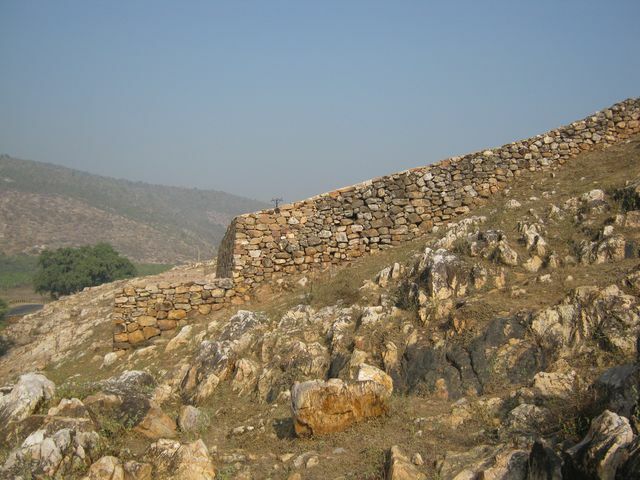 Then we drove back to Rajgir and ate lunch before continuing on our drive to Jethian. The road to Jethian is along the south side of the ridge beginning with Sona Hill. We drove for about 12km and then took a right (northwards) turn zig-zag up the hill and through a pass. A new rail line seem to under construction or being repaired (not sure). We got advice from people in the village of Lathivana that it was unsafe to go to the Rajpind Cave due to bandits. If we were to go, we should go in a large group and take armed police or soldiers with us. We stopped to look at the remains of the Supatittha Cetiya with a Buddha statue commemorating a place where Lord Buddha stayed when he visited Lathivana (according to Ven. Dhammika in Middle Land, Middle Way). We also looked at the statue of the Bodhisatta Padmapani stuck on the front of the local school (Saravoday Viddyalaya). I was not very impressed with either of the statues. I was more impressed with the landscape and the recollection that Lord Buddha and many Arahats had walked around there, gone on alms round and meditated there. 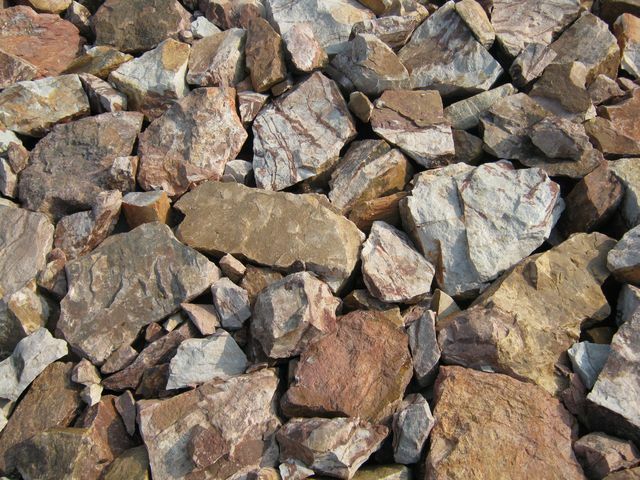 The rugged rocky hills are quite beautiful though probably would have looked much different 2500 years ago when there were forests, jungles and many more animals in the area. I resolved to come back with a larger group one day. 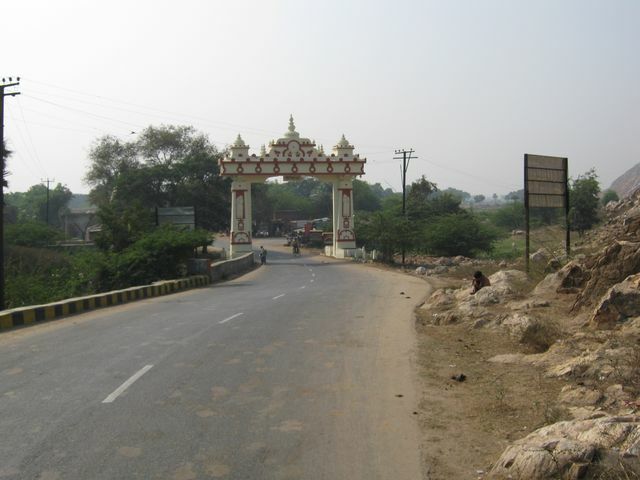 We drove back through the pass and on to Bodhgaya. I checked in to the Deep Guest House again and then walked down the road to the Mahabodhi Mandir to circumnambulate 3 times. Bodhgaya seems more familiar to me now. Mahabodhi Mandir is just as crowded as it was last time, though the Theravada Buddhist chanters seem to have packed up and gone home – a good thing from my point of view. There appeared to even more Tibetan Buddhist prostrators than the two weeks ago when I was last here. On Friday, 18 December 2009, as I was walking along Fraser Road, Patna from the Internet cafe back to Hotel President after my last posting, I stopped by a small shop to buy razors, batteries and biscuits. While in the shop a 31 year old Indian man asked me about my background and what I am doing etc. After a short conversation, he asked me to teach him meditation so I gave him a quick overview of the Mahasi Sayadaw method of Buddhist vipassana (insight) meditation. He and the shop owner were very happy to meet me and listen to the instructions. I hope they benefit. 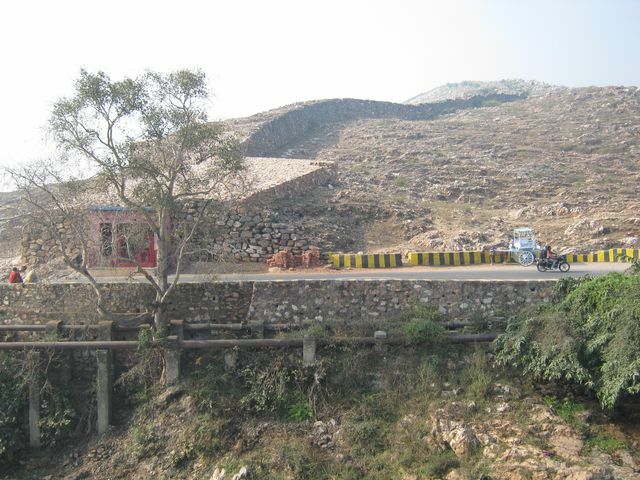 The next morning, Saturday, 19 December 2009, I went by cycle rickshaw to the Patna Junction train station and bought a train ticket for the trip to Rajgir. It was unreserved and only cost 38 rupees. I found a seat no problem because the train was originating in Patna. It became quite full along the way with many people crammed onto seats. The other passengers gave me plenty of room and I had interesting conversations with some young men in the same compartment as myself. I counselled one young man aged 23 about his plans for the future involving a girlfriend and his attempts to get ahead financially. All my interactions with Indian people are teaching me a lot about culture and my own limitations. Many times I wished I could speak Hindi/Urdu. At the last stage of the 4 hour train journey, some young students advised me that the train was unable to go all the way to Rajgir and had to end the route at Nalanda, about 12 km north of Rajgir. So I got off the train with the students at Nalanda and walked about 500 metres to the road to wait for one of the frequent local buses to Rajgir. 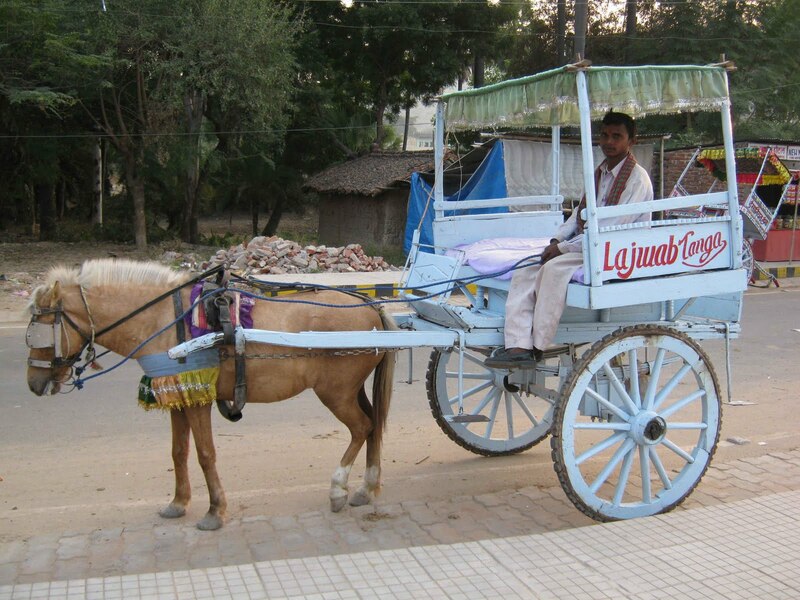 The other option was a tonga (single horse driven cart) with many passengers. Several buses stopped and what seemed to be three times the buses capacity, crammed on board. Even the roof rack was full of young men. Eventually, one eager bus conductor grabbed my backpack and stowed it into the boot of his bus and insisted that I push my way through to the front of the bus and sit next to the driver, almost on top of the gear stick. The fare was only 6 rupees. Many more stops later, we arrived at Rajgir. I then rode a cycle rickshaw to Hotel Siddarth, Venuvan park (Veluvana) and the hot springs. I checked many rooms from 2500 per night and settled on 450 per night for a twin bed room with no AC and no hot water. A room with hot water would have cost 800 or 900 (can’t remember). I imagined I could go over to the hot springs for my evening bath. It turned out to be very crowded at the hot springs even at 8-9pm when it was quite cool walking around and I didn’t go in the water. There were many locals and a lot of Bhutanese and Burmese pilgrims bathing noisily at the hot springs. So I had a cold water bath from a bucket. The hotel wouldn’t give me a bucket of hot water either. The assistant manager was very kind though, he walked with me to the hot springs and encouraged me to bathe even though it was crowded. 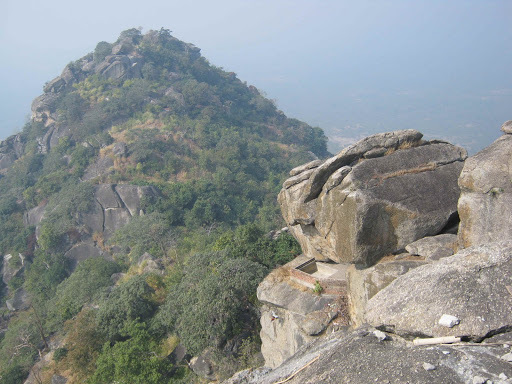 On Sunday, 20 December 2009, I had breakfast and then hired a driver, Mr Bhima Chowdrey, with tonga to take me to Sona Hill (previously known as Isigili – Gullet of the Seers). It was relaxing to sit cross legged on the tonga and experience a slower more leisurely pace. From the narrow pass between Udaya Hill (east side) and Sona Hill (west side) we climbed up the base of the hill and walked along the top of a reconstructed wall upwards and westwards. 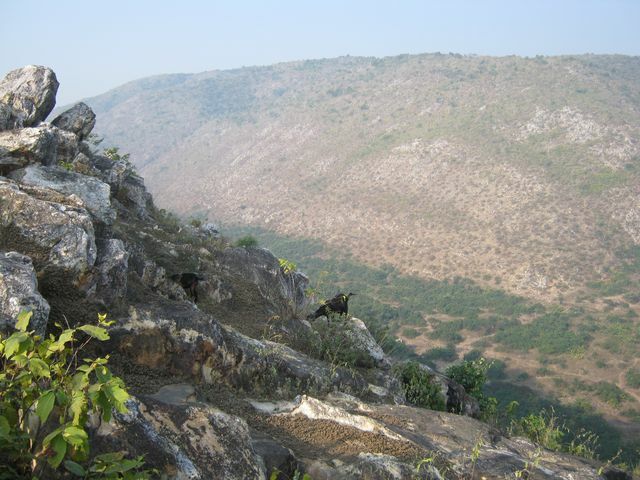 ABOVE: We passed many goats grazing beside the wall (looking west-north-west) on Sona Hill, near Rajgir, Bihar, India. After walking about 500 metres or more up the slope on top of the wall, to the north I could see into a gully between two more ridges that looked like a desperate sort of place that might be a “gullet of seers”. 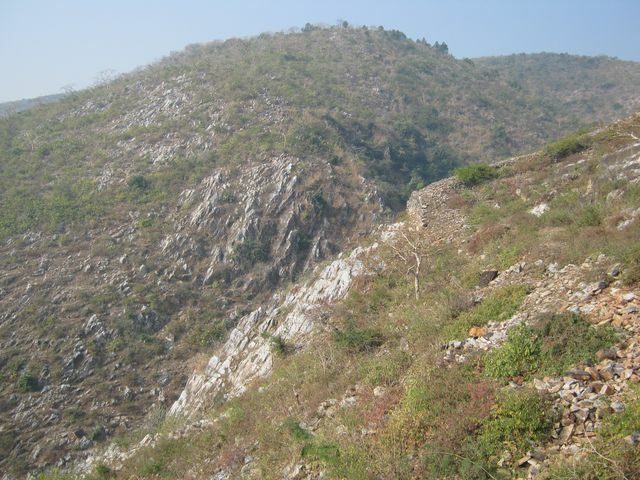 ABOVE: A view looking north from Sona Hill, near Rajgir, Bihar, India toward an interesting gully. 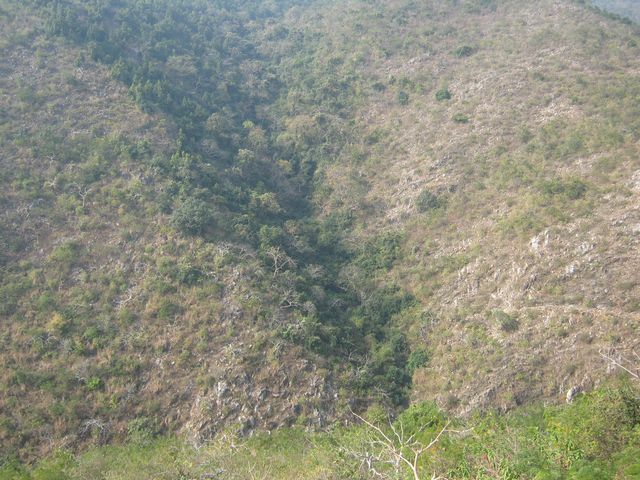 An old section of wall is just visible on the right side (east) of the gully. 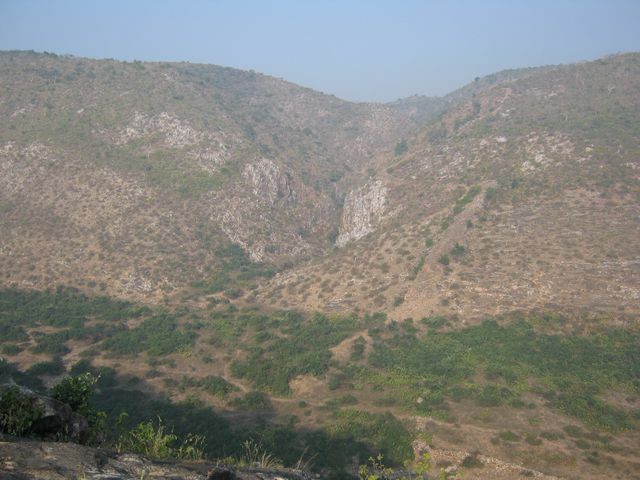 ABOVE: A view looking west at the lower slope of Sona Hill, Rajgir, Bihar, India. 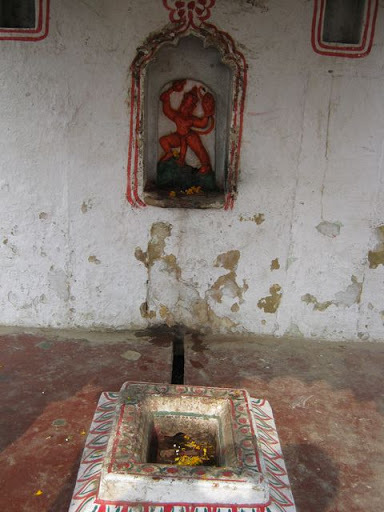 A small red Hindu shrine is visible at the base of the recently repaired wall. 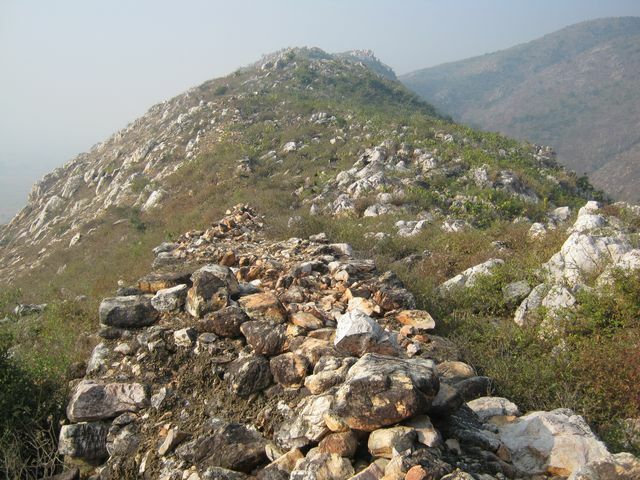 ABOVE: A view looking south west at Sona Hill from the lower slope of Udaya Hill, Rajgir, Bihar, India. A Hindu shrine is just visible behind the tree on the left side of the photo. The bridge over the stream is outside the frame on the right. 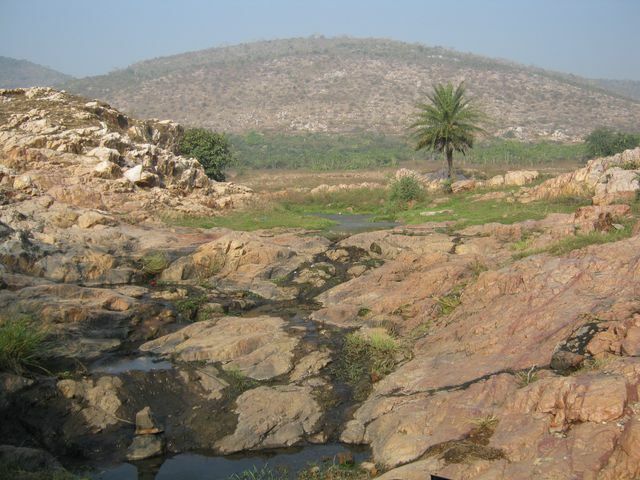 Mr Bhima and I went down to our starting point and then I explored the small stream heading southwards between the Sona Hill and Udaya Hill. There was a car wreck in the middle of the stream and a lot of rubbish and algae. 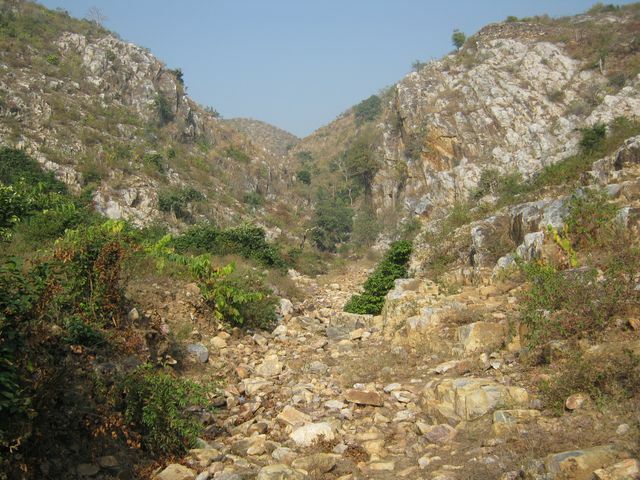 Then I walked westwards along the southern base of Sona Hill towards the mysterious gully I had noticed earlier. I intended to walk into it much like the more than 500 Paccekkhabuddha (non-teaching Buddha, unlike our Gotama Buddha who was a Samasambuddha) had done in the Isigili Sutta. 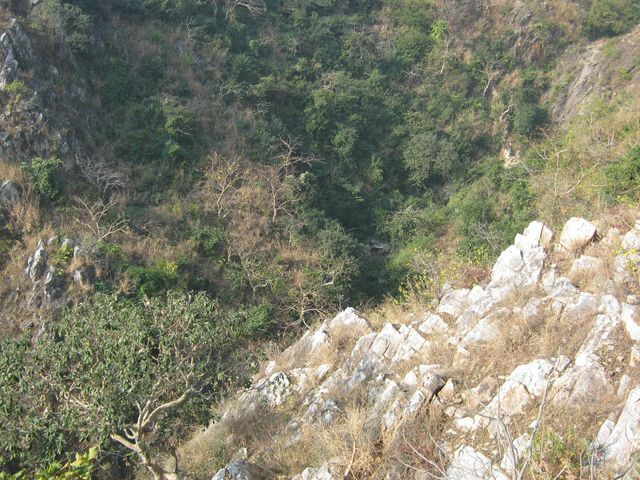 However, Mr Bhima forbade me to walk into the gully because there were bees or wasps there that would attack us. Instead I climbed another wall, one that had not been reconstructed or had very little recent repair. I could look into the gully and took a few photos of gully and surrounding landscape. It is a beautiful place. I would really like to visit it again. 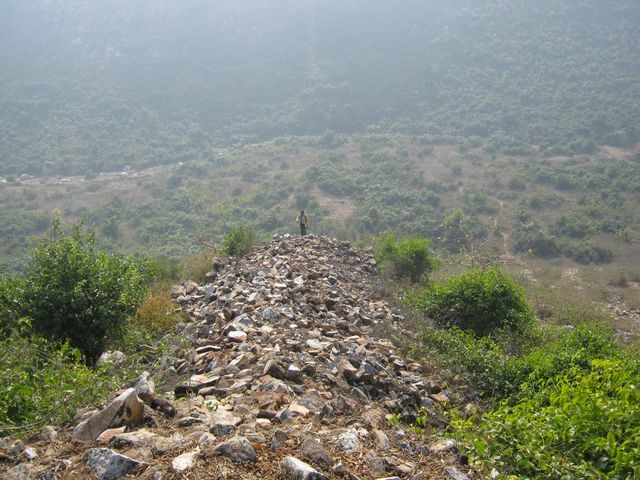 ABOVE: A view looking south along the wall located on the eastern side of the interesting gully near a hill north of Sona Hill, Rajgir, Bihar, India, mentioned earlier in this blog. Mr Chowdrey is visible walking along the wall towards the camera. 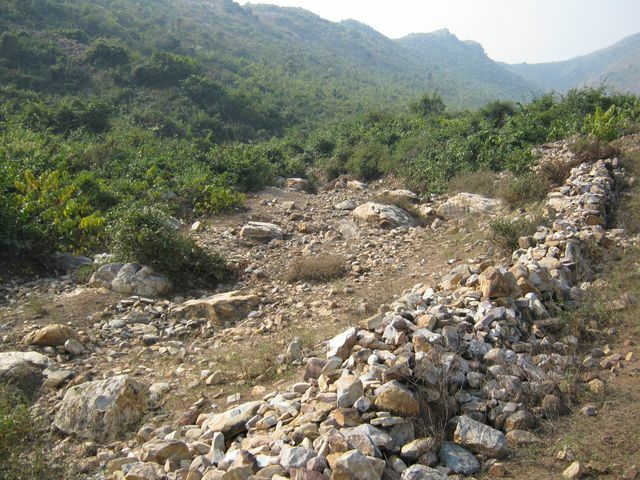 A dry stream is just visible in the photo at the base of Sona Hill in the background. I could not see the famous Kaalasilaa – black rock. Maybe it has been destroyed by nature or removed by humans since the time of Lord Buddha. Maybe I just needed to explore more… As I was about to return to the tonga, 15-20 local women came walking up the hill. Mr Bhima told me they were going to collect sticks. I didn’t take photos of them. After returning to the tonga, we went to the village just south of the narrow pass between Udaya Hill and Sona Hill. Mr Bhima had some chai and a smoke. I didn’t drink the chai because it had a burnt smell. 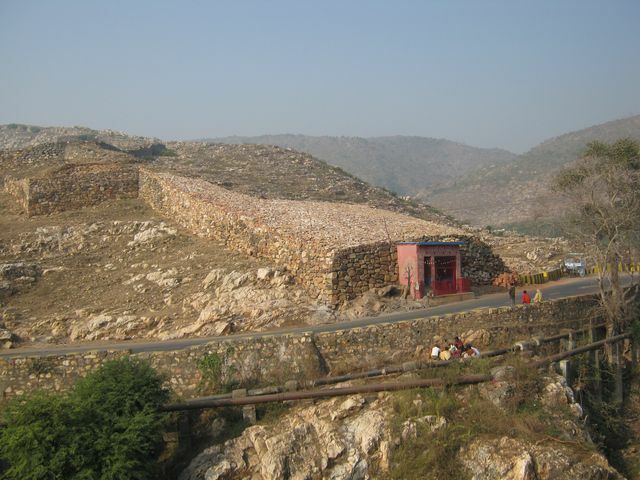 Going northwards through the pass, we briefly stopped at a stupa which Mr Bhima told me was an old Buddhist university. It appeared to have rooms for monks and larger rooms for meetings though overall it isn’t very large. There were no official signs on site indicating what the site represented. We continued northwards back along the route we had taken to get to Sona Hill. We stopped briefly to look at the ancient chariot tracks in solid rock. One story to explain the tracks is that they were made in ancient times by the frequent passage of carts and chariots through this area. 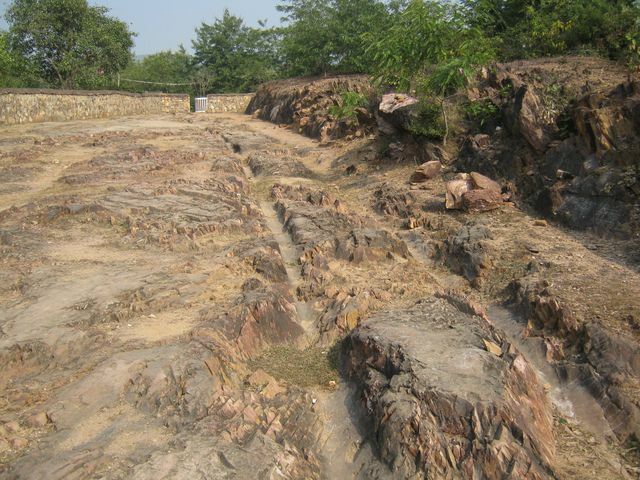 Mr Bhima explained that locals believed the tracks were made by Ajuna’s chariot driven by Krishna and that other dents in the nearby rocks were made by Bhima (also from the Mahabharata) as he fought with an opponent. 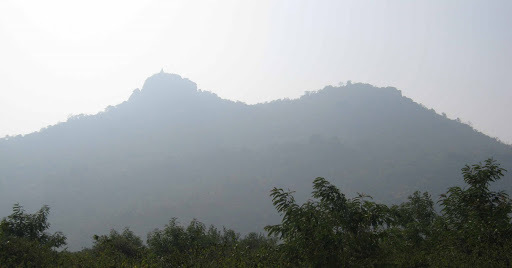 We continued further about 2-3km then turned left on the road to Sonbhandar Caves at the base of Vaibhara Hill. In Middle Land Middle Way, Ven. 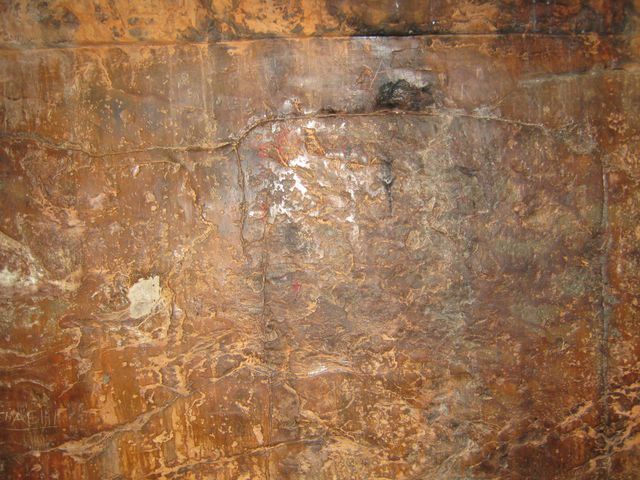 Dhammika wrote that two caves were carved for the use of Jain Ascetics. 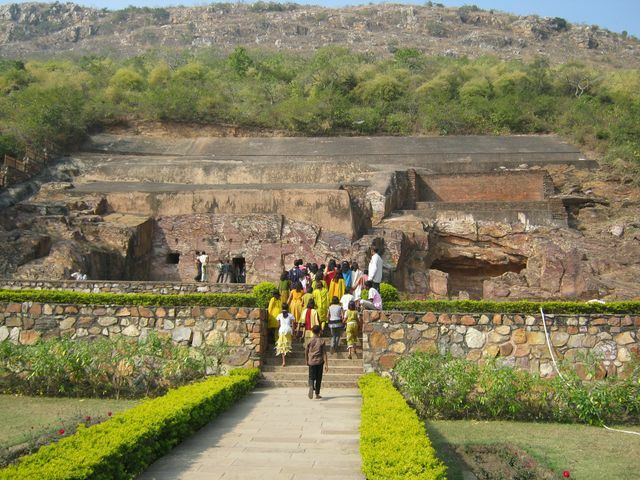 However, Mr Bhima and the local guide explained that in fact the caves were used by Buddhist ascetics. 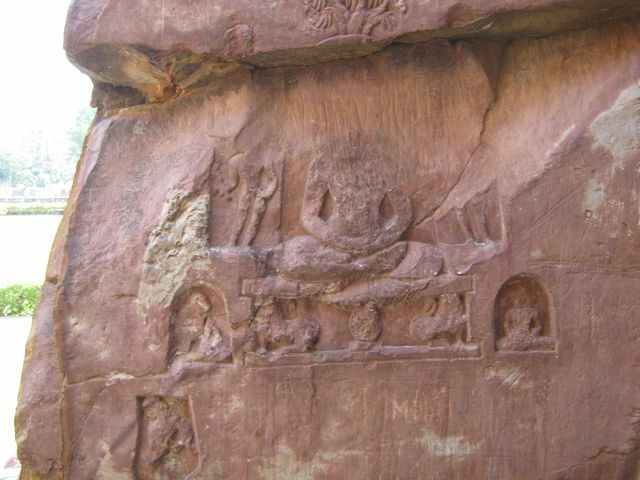 Most of the carvings in the caves appear to be Buddhist. The local guide was emphatic that the caves were created for the use of Buddhist ascetics. He also claimed that there is an ancient 3 mile tunnel connecting the southern most cave with the Sattapana cave. 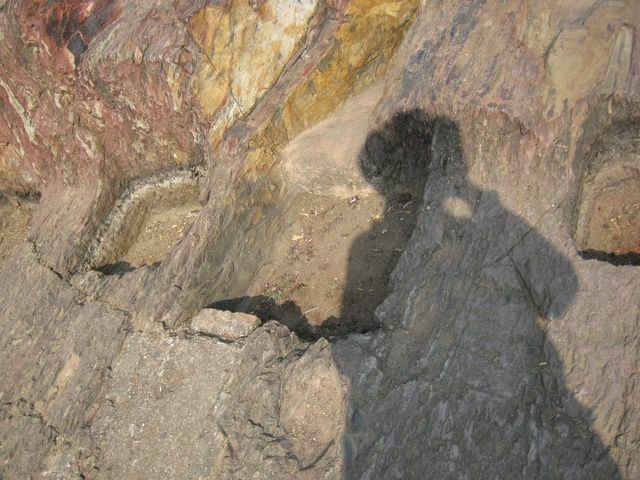 He pointed to creases in the rock which formed the shape of a door way. At the very top of this crease, at the apex of the “door”, was an indent. The guide explained that the British had placed a cannon outside the window of the cave and fired at this crease in an attempt to open the door. They could only dent the rock. These stories may or may not be true. 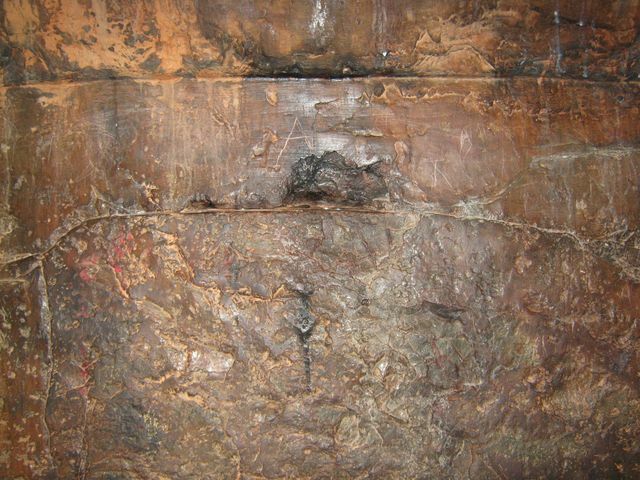 ABOVE: Another view of the dent at the top of a “doorway” located on the inside wall of the southern-most Sonbhandar cave near Rajgir, Bihar, India. This image shows more of the door shaped cracks. This crack on the left side is not complete and becomes smooth. I asked him some questions about the Sattapana cave being rather small to hold a meeting of 500 monks for the First Buddhist Council. He said that it was much larger in the past but was damaged in an earthquake in 1934 (and possibly many earlier earthquakes?). 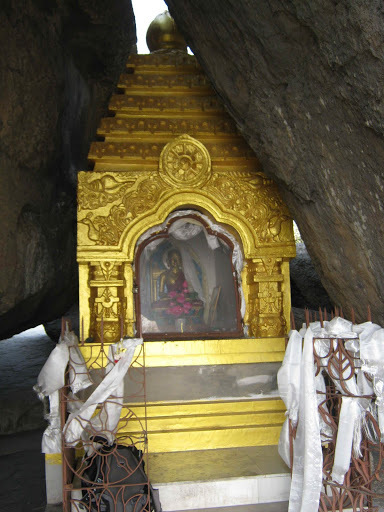 He repeated his assertion about the tunnel linking Sattapana Cave and the southern Sonbhandar Cave. 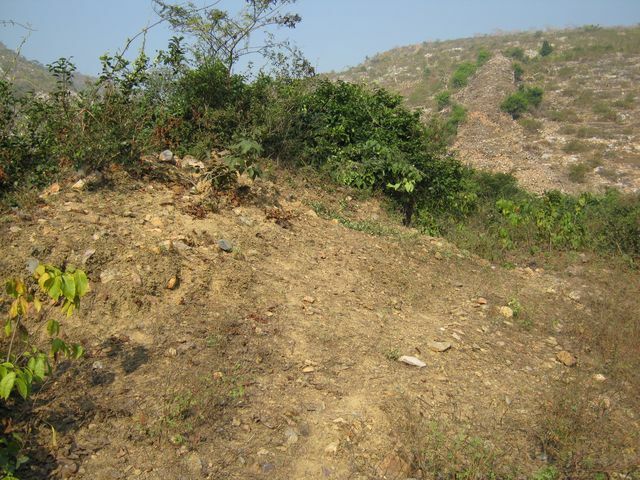 I also asked the guide about Sona Hill, Isigili, and he recommended not walking along the wall or around the area because local people might be dangerous. I mentioned that I had already been there this morning and he was surprised. Mr Bhima then spoke with the guide in Hindi. 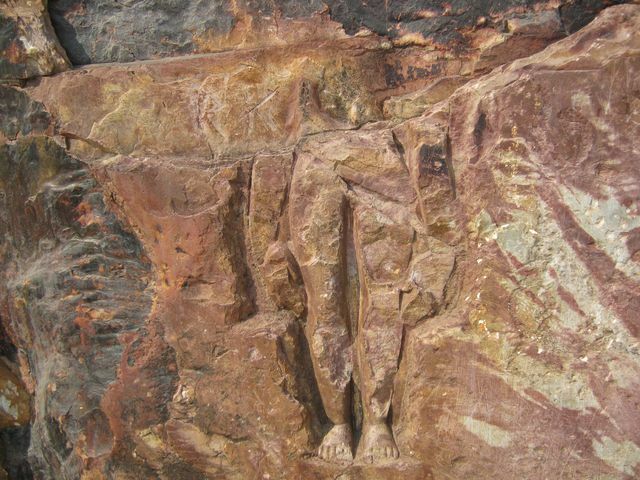 While taking some photos before leaving a 60 year old well-dressed Indian man escorted by 3 younger men suggested that the carvings were of Jain origin. 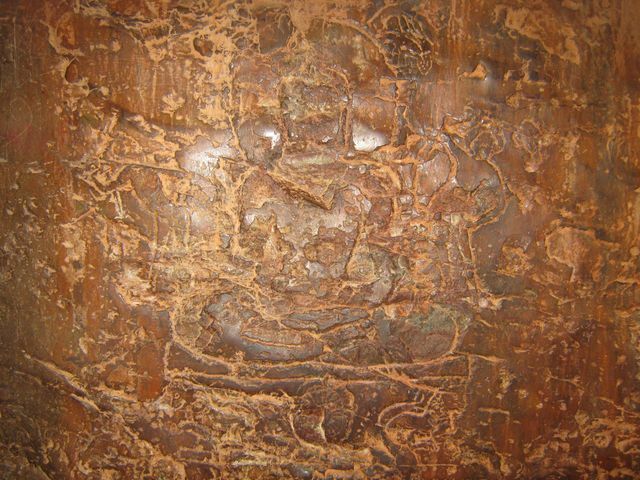 I pointed to the top-knot, Dhamma wheel and lions which all indicated these were images of Lord Buddha. He then spoke loudly in a kind of monologue about the loss of Indian culture and one day India will be a slave again… I tried to leave gracefully… He told me he was a district judge for Bihar state. Back on the Tonga and northwards to Rajgir for lunch at the Green Hotel and then into the Rajgir town to the only known Internet cafe. Unfortunately it was not working, either the connection would drop or the computer would freeze up. I was exhausted from all the climbing and after a bucket bath, I had a 2 hour nap. Then I read more Patisambhidamagga (The Path of Discrimination) translated by Bhikkhu Nanamoli. This is an excellent book though possibly only interesting for scholars and Buddhists who have been intensely studying other Theravada Buddhist texts. On Friday, 18 December 2009, I ate breakfast and then headed to Patna Junction train station to possibly buy some train tickets for future journeys. I got some help from an official at the Bihar Tourist office located in the train station to hire an auto rickshaw to visit a stupa reputed to be one of the two stupas constructed after the death of Mahathera Aananda (Lord Buddha’s personal assistant in the last 25 years). 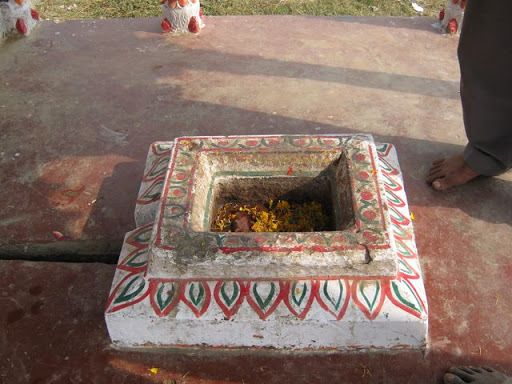 The stupa is not well maintained and currently has a Hindu temple on top – the Ramchaura Mandir. My amateur guide said this is a Mahavir temple (he meant the Hindu God Hanuman, not the Jain teacher). Mahavir means “great hero” in Hindi or Sanskrit and is a title used both by Jains and Hindus to refer to different beings. 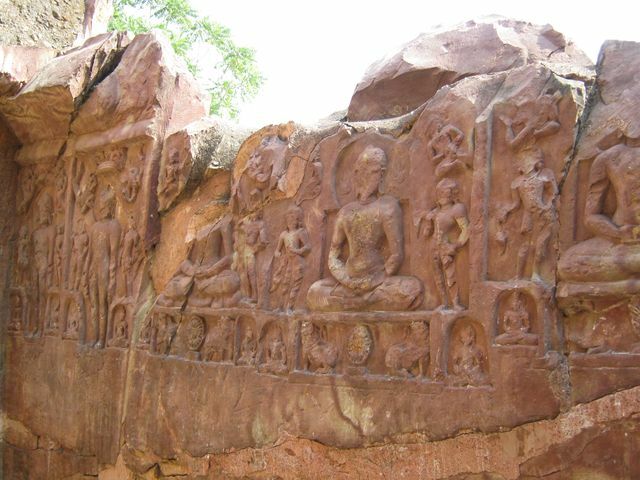 Buddhist texts refer to the Jain teacher by his ancient name of Nigantha Naataputta. Along the way there and back we drove across the Mahatma Gandhi Setu bridge (http://en.wikipedia.org/wiki/Mahatma_Gandhi_Setu) – the largest river bridge in the world towards Hajipur. The bridge itself was quite a bumpy ride due to the many joins not lining up properly and moving up and down with heavy trucks. On the way, we were stopped by an aggressive policeman (his face reminded me of a vulture) who tried to get a free ride to some place that would have taken us way off track. He shouted aggressively in the face of the auto driver who plaintively pointed at me and said we were going in another direction. The policeman just waved his stick around and then pulled the driver behind the cab where I couldn’t see and demanded 50 rupees before letting us go. I was told this happens all the time. I witnessed it myself in Gaya, Bihar when three police men tried to get into the auto rickshaw I was in. Luckily they changed their minds when they noticed me. Another time in Varanasi, Uttar Pradesh, when I was on my way to Sarnath, a policeman got in and rode for free most of the way. Luckily he did not divert us from the path we were supposed to be on. I suppose the police men need to get around and don’t have patrol cars as in Australia. Even so, it is not good to be so aggressive and then demand money etc. Once over the bridge in Hajipur, we took directions many times from pedestrians and the way became extremely bumpy, even a motocross bike would have problems with some parts of the road. I held on as we violently jerked around and didn’t bump my head or other parts. We finally arrived at the site and I took many photos as I walked around. I paid respects to the site and remembered Mahathera Aananda. I was a little doubtful about the place. It is definitely an ancient stupa but I am not sure if it was the right one. We stopped for chai 3 times during the journey. It took almost 3 hours for the complete journey to and from. 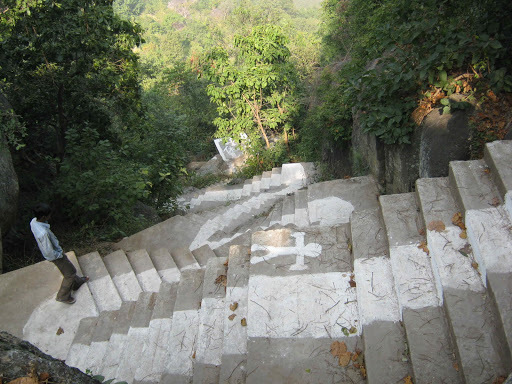 After learning the hard way, I’d like to share the easy way to get to Ramchaura Mandir with future pilgrims. To get to the site from Patna, take an auto rickshaw from Patna Junction train station for about 600 rupees. After crossing the Mahatma_Gandhi_Setu bridge take the first left (turning westward), go about 100-200m bending road then at the t-junction, turn right (head westwards again). The road is good most of the way if you follow the right roads. Then keep heading west for a while – maybe 1km. The road is good but becomes very narrow and leads to a series of Indian sweet shops with a 4-way crossing. Take the left (southwards) and the road will soon become quite rough. Keep going for about 200m and then turn left (eastwards) at a 4-way crossing (maybe the second or third along the way). 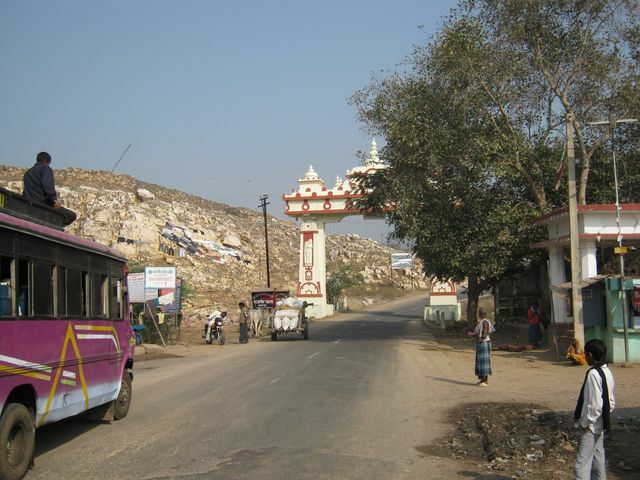 The Ramchaura Mandir is about 30m down the road on the left. You need to have a Hindi speaker with you who can ask directions and confirm you are on track. Get double and triple confirmation from many other locals along the way. 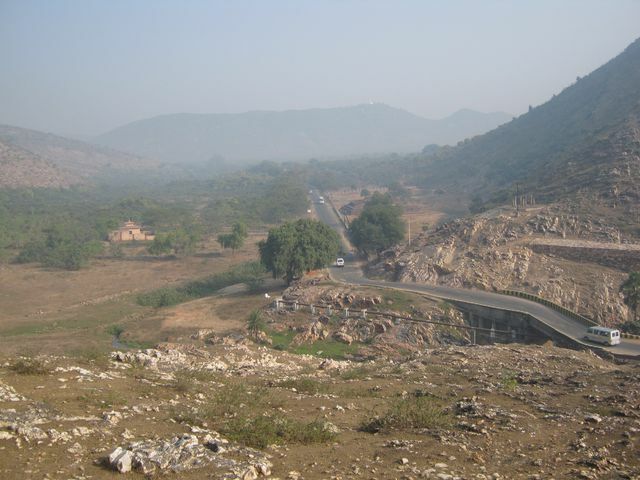 I’ll go to Rajgir by train tomorrow morning (Saturday, 20 December 2009) and then maybe to Gaya and on to the Betla National Park. I’d like to see what a forest/jungle looks like in India because many monks had spent time in forests during the time of Lord Buddha. After that, I may go to Varanasi for a night then Allahabad/Kausambi, then Lucknow for its museum and then Sankasiya and so on. Travelling in this way is tiring. I take it easy sometimes by resting an extra day in some places. I will be happy to stop in Sri Lanka at a meditation centre for a few months and meditate again. I miss meditation and a community of sincere Buddhists. I have found few to talk with who understand me or with whom I can relate to – but this is normal for me, even in Australia where so few people are Buddhists or even if Buddhist, understand the Dhamma in a similar way. So as usual most communication is relatively superficial because it is about worldly things such as cricket, salaries, status and food. In significant ways, there is a lot in common between Australia and India. People who have heard the Dhamma are rare in this world and those who have some understanding of it are even more rare.